Defining the Future – Kansas City’s Opportunity. How to trumpet Good News? the Bullhorn? Young and old, big and small – the future is ready, are you? It spreads in the daring minds of pioneers. Architects of the future are now increasingly valued in the World – more than at any time in recent memory. Those minds are being encouraged and fed greater resources. 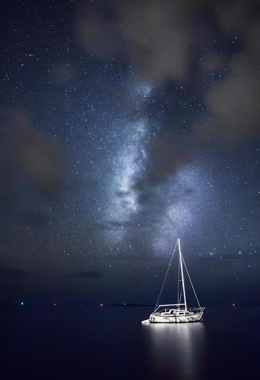 Resources to build, room to dream, frontiers to conquer, sails to set and horizons to eye. Today, explorers and adventurers have the ‘royal ear’ and the New World is here once again. It is our same old World seen through transformative eyes . . .
New Kansas City, and New Austin soon. What will we call that place on the slopes? New Provo sounds nice! Google is sending out the fearless, the bold, and are planting flags of the future in the Heart of America. A new product launching called Google Fiber – and running glass – fiber optic cable, to connect the World in ways in which we should have already been connected. As daring and bold as it is, what we are seeing is merely the groundwork for what is to come – people connecting, sharing, building new things – better things for a better tomorrow. Ford, Chevy, Sony, Microsoft, Apple and Small Businesses – there are new ‘roads’ being built for your products and services. Get off your laurels – the time to act is now – and ever now. The only foes in this bright and exciting New World are those keepers of the old order – fat, complacent cats dining on old hoarded cheese. The Fiberbahn is being built, line-by-line, street-by-street, pole-by-pole, city-by-city, and mind-by-mind. When someone jumps in to build a better World, a better way – open your mind and wallet and get on board. Buy-in and build. Enjoy being part of building and creating the new and improved – FOR REAL. Don’t think 20% better, or twice as good . . . . Think 100 Times – Faster, More Powerful. The old ISP and cable feudal lords know that the ‘gig is up’. Sad that someone entirely outside the industry had to come in and build a platform for the future – but there is much excitement, because a fiber-optic network is finally underway. 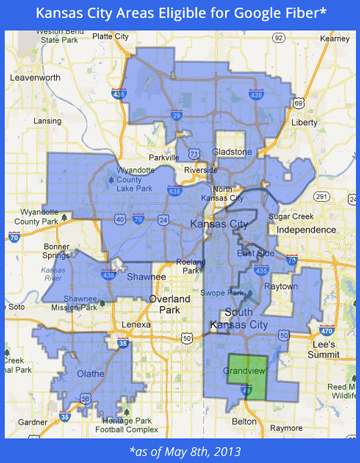 The clamor for Google Fiber is resounding throughout our land – ask any city leader about the calls and emails that they get, saying “Can we get it? When can we get it??!”. Indeed. Thank you, Google for having the vision and guts to begin building what will hopefully grow into a nationwide fiber-optic network. And thank you for choosing Kansas City as your first market. The light is shining, the future is here – and it is double-parked . . . Let’s Go! Envision how our bright future will look and help build it. There are no monsters in the uncharted waters. The Earth is not flat. The waters of the oceans don’t spill off the edge of the map into oblivion. There are new vistas to behold, new ground to break – and it is all around you as far as you can see – wherever you are. I see the pioneers of today building the World that they want to live in. Bob Bigelow is building a fleet for travel into space with plans for a lunar settlement and he is making progress. 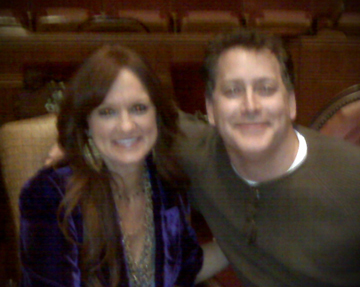 Ree Drummond, ‘The Pioneer Woman’ (and dear friend) has built a fairytale into a televised, and best-selling reality in Pawhuska, Oklahoma! I can’t wait to dine at her new restaurant that is in the works (from what a little bird told me). Google is laying a fiber optic network which will transform the way we live in ways that we are just now starting to imagine – and providing tools and opportunity – necessary means for us, our children and the leaders of tomorrow in America – to employ. Build the future, think of ONE HUNDRED TIMES . . . Bigger, Better, Stronger, Faster. Be part of a New Renaissance of all communications, commerce, products, services and their exponential impact of their application. Leave complacency behind – on the couch, in the cubicle. Re-think goals, dare to dream ‘What if?’ and put on your running shoes and join in. I’ll see you on the frontier. 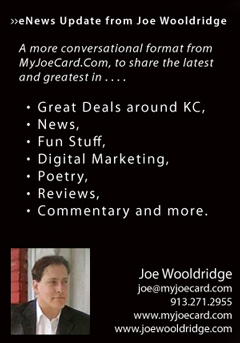 Shop for the best and latest deals by great Kansas City merchants. • Call 913-271-2955 and reference code 8May13. 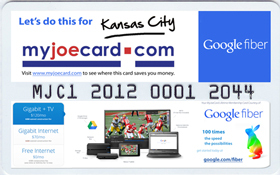 Get A Card Don't have a MyJoeCard yet? Order Online & we will send one out to you!